This sweet owl hat with jeweled eyes and nose for girls ages approximately 3 to 8 is just the right thickness to keep her head cozy warm without being bulky. Makes a great holiday gift for girls or stocking stuffer for the little owl lover in your life. A fun and functional warm winter knit hat for indoors or out. Makes a cute chemo cap for girls with hair loss due to cancer or alopecia. Perfect converge over the ears and neck; soft enough for a bald head. 100% acrylic. Hand wash, air dry. Meet Olivia the Jewel-Eyed Owl knit hat for girls aged 3 to 8; the wise choice for girls who love to sparkle and shine! 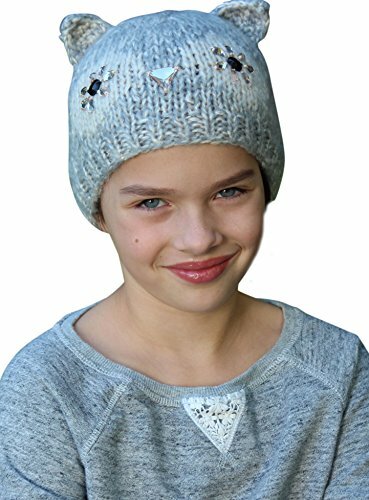 This soft and sweet girls winter hat is soft enough for the most sensitive heads, making this a great chemo cap for girls and alopecia hat for girls.